I'm thinking all the time, sometimes I write down these thoughts. Journalism has an overwhelming fascination with balance. Generally this is a positive attribute for a journalist to to have. Usually, when reporting the news, it is important to research the story from all points of view. It wouldn’t be a good look if a journalist were to report a one-sided story containing only the hearsay of someone who is known to mislead and misrepresent information, and just generally lie without seeking an opposing angle (see, here and here). The big problem with balance in the media, comes when reporting on matters of science. When reporting on issues such as climate change or vaccination, that overwhelming need for “balance” is often achieved by placing a scientist side-by-side with someone with little to no qualifications in the area. The thing is, that when it comes to science, opinion isn’t news. I recommend this video from HBO’s “Last Week Tonight with John Oliver” as an example of how to more accurately report on the climate change “debate”. Climate change deniers and anti-vaccination campaigners love to legitimise themselves in the media by using that word: ‘debate’. There lies the main problem. In the scientific community there isn’t any debate on either of these topics. By providing a “balanced debate” on these issues a reporter is in fact inaccurately representing the truth and providing what is known as false balance. When anti-vaccination views are portrayed side-by-side with scientifically accurate pro-vaccination views, it gives the anti-vaccs opinions undue credibility in the eyes of the audience. It is, in fact, less damaging to the public’s opinion to allow the anti-vaccs to appear alone. Unsurprisingly, the participants who read the article saying vaccines cause autism indicated they would be less likely to have their children vaccinated in the future. But what was surprising was those who read the false balance article were even less confident about the safety of vaccines than the “vaccines-definitely-cause-autism” article. The thing is, at the the end of the day, false balance isn’t even rewarded by your peers. This year’s National Press Club award for health reporting and award for ‘Best Documentary or Documentary Series – Health, Health Sciences or Innovation in the field of Health and Health Sciences’ went to journalists who had focused on the issue of vaccination. Both “A pox on both your parents” and “Jabbed: Love, Fear and Vaccines” avoided false balance. My final words to the media: there is no debate. 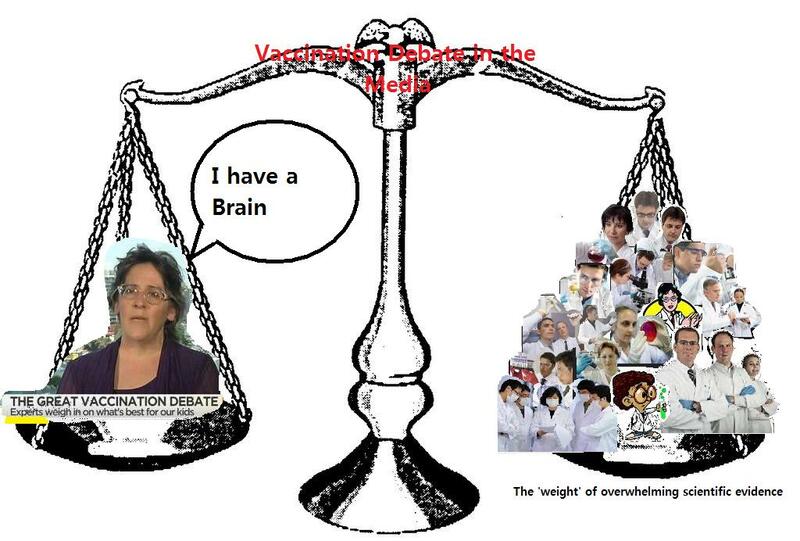 By presenting anti-vaccination views beside an expert on vaccination, you are legitimatising their unqualified “reckons“. I’d go as far as to say that you are endangering a vital health initiative, and thereby partly responsible for the spread of potentially fatal vaccine preventable diseases. This entry was posted in science communication, Sciencey stuff, Vaccination and tagged Australian Vaccination Network, Australian Vaccination-Skeptics Network, AVSN, false balance, Science, Skeptic, Vaccination by spikyheidi. Bookmark the permalink. Looking at YOU radio 6pr who a few days ago got Meryl Dorey to speak re the decrease in WA immunisation rates, followed by Rosa Capolingua AMA President. Classic false balance, and I had hoped they’d thrown out Ms Dorey along with Howard Sattler. Apparently not.